With its scenic beauty and plethora of enthralling activities, it’s no wonder why Deep Creek Lake is a popular vacation destination. There is so much to see and do that you’ll want to take your time and soak it all in. Choosing the perfect place to stay is a crucial part of the vacation planning process. Let us take care of your Deep Creek Lake accommodations. Deep Creek Lake State Park is a great place to enjoy the pleasures of the lake. However, there are numerous places to enjoy the outdoors around Deep Creek Lake, including the state’s only four-season resort, Wisp. No matter how you choose to enjoy the area where you stay will have a huge impact on your trip and we know we can provide you with the finest in Deep Creek Lake accommodations. Lake Pointe Inn has Deep Creek Lake accommodations that include seven beautiful rooms, each with its own private bath and gas fireplace. 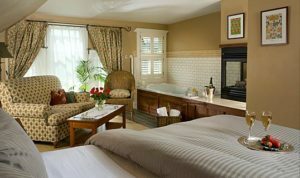 The Sam Leff Room is a prime example of the inn’s Arts and Crafts decor with a warm color scheme, Mission-stye furniture, “Pine Landscape” fireplace tiles and William Morris fabrics. The Sam Leff Room also has amazing lake views down Marsh Run Cove. The Savage Room is known as a great place for celebrating special occasions or just indulging in a bit of luxurious relaxation. The room features a spa tub big enough for two and a private balcony for taking in the lake. In addition to our rooms, our Deep Creek Lake accommodations include a selection of suites. For instance, the Buffalo Marsh Suite features a queen size bed, a fireplace with hand made New Zeland Porteous tile and a private bathroom with a deep spa tub and steam shower. The view of Marsh Hill Mountain from the Buffalo Marsh Suite is breathtaking. The McCann Suite is situated in the corner of the second floor and has a small balcony that provides a beautiful lake cove view. Guests choosing Lake Pointe Inn for their Deep Creek Lake accommodations not only get to relax in our one of our luxurious rooms or suites, your stay also includes a delicious full breakfast each morning. If you plan on getting out and seeing the Deep Creek Lake area early, take advantage of our continental breakfast option. Otherwise, breakfast begins with a fruit dish and then you’ll enjoy a hot entree, alternating sweet with savory daily. Cereals, muffins, breads and homemade granola are also available during breakfast. Breakfast is served from 8:30 to 9:30 am in two dining rooms. When you let Lake Pointe Inn take care of your Deep Creek Lake accommodations, you’ll also get access to our massage services. We offer Swedish massage, hot stone therapy and reflexology by appointment. Hot stone massages last 80 minutes and combine various techniques with warm lava stones so you can achieve the utmost relaxation. Our Swedish massages last an hour and increase body circulation with a gentle full-body massage. So, for an exceptional experience at Deep Creek Lake, our McHenry bed and breakfast is truly unmatched. Lake Pointe Inn will take care of all your needs so that your trip is the ultimate success.